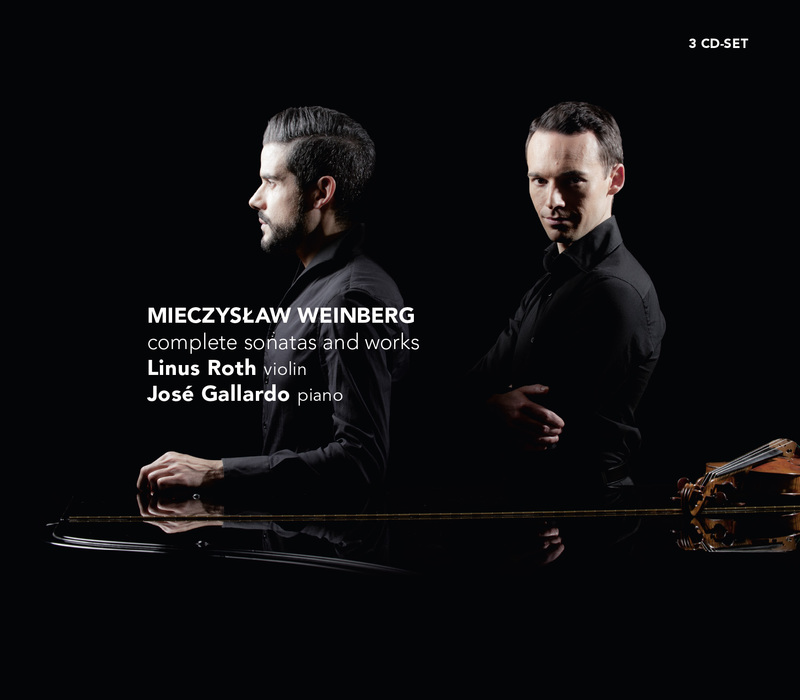 A special project: Linus Roth and José Gallardo are the first to interpret Weinberg’s sonatas and works for violin and piano in a complete anthology! Noted German violinist Linus Roth and the Argentinean piano virtuoso José Gallardo feel a lot of compassion for this composer. It's all there in his beautiful and deeply emotional music where Weinberg put so much of his soul. As a great master of contrasts he goes from very dark, to very bright, from a fortissimo when you think the world breaks into pieces, to a pianissimo you can barely hear. In one bar there can be hope, and in the next bar: no hope! Linus and José feel obliged and honored to be advocates for Weinberg because they think his music deserves it! Now it was time for them to record the "Complete Sonatas and Works" for violin and piano of Weinberg on a 3CD. This has never been done before! Weinberg’s repertoire has always been only partially performed and recorded, but never as complete collection. The Sonatas Nr. 2 and 6. are even never recorded before and the Rhapsody on Moldavian Themes is the only one available recording right now - it was once recorded around 40 years ago, but the vinyl is not available to buy any more. Dear Jim, The booklet has been send to you by mail! Dear Christopher, The booklet has been send to you by mail! I spilled coffee over the notes to the complete Violin Sonatas of Weinberg: is it possible, please, that you might let me have another copy? I am perfectly happy to pay for it. Thank you. ""The German violinist Linus Roth and the Argentine pianist José Gallardo bring his complete works for violin and piano."" "Not an easy listening experience by any means, but a profoundly moving one." "Roth and Gallardo overwhelmed the audience." "The result is a dedicated hommage to Mieczyslaw Weinberg with technical and musical accomplishment." ""The intelligent interpretations and general accessibility of these works, is sure to win many new fans and admirers."" "Roth and Gallardo control Weinberg lyricism and melancholy into the capillaries." "Roth and Galardo play these compositions so striking, evident and internalized that following artists will have to compete with this recording." The performances of both artists are virtuosic and commendable, while the recording quality is generally excellent "
"Altogether, then, these discs are remarkable. The performances of both artists are virtuosic and commendable, while the recording quality is generally excellent "
"Linus Roth and José Gallardo perform Weinberg's music with verve, passion and enthusiasm."